Continued from: The Anglo-Saxon Fyrd c. 400 - 878 A.D. The Kingdom of England was forged in the furnace of Viking invasions. Quite simply, the depredations of the Danes aided Wessex by extinguishing all other royal lineages. By 900A.D. only the those of Cerdic remained, and the kings of this dynasty found that their survival depended on a total reorganisation of their realm, both administratively and militarily. The Anglo-Saxon Chronicle entry for 871 gives us a good idea of the nature of the military system that Alfred inherited from his father and brothers. After describing six battles, the annals conclude with the observation that 'during that year nine general engagements were fought against the Danish army in the kingdom south of the Thames, besides the expeditions which the king's brother Alfred and single ealdormen and king's thegns often rode on, which were not counted.' From this, and other sources, it would seem that the West Saxon military establishment consisted of three general types of army: the national host, shire forces led by individual ealdormen, and the war bands of individual thegns. The first of these is sometimes referred to as the folc, and was characterised by the personal leadership of the king. It would consist of the king with his own personal war-band, augmented by the war-bands of his ealdormen and thegns. However, each of these territorial units was an army in itself. An eighth or ninth century ealdorman could wage war on his own initiative and was expected to do so in defence of his scir. Just as the national host was made up of shire forces, so the shire forces were made up of the followings of individual local thegns. These thegns, in turn could mount raids of their own, but the sources unsurprisingly take little note of these small war-bands. None of these forces, not even the folc, was the 'nation in arms.' All were war-bands led by chieftains, whose troops were bound to them by personal ties as well as by the 'common burdens' imposed upon their land. In essence, they still remained the king's following arrayed for battle. Despite the lordship tie, Alfred's difficulties in 878 were due in no small part to his dependence upon the 'common burdens' for the defence of the kingdom. The growing importance of bookland aggravated certain problems previously encountered in connection with the earlier landholding gesiðas. Quite simply it took time to summon and gather warriors from the various localities, and a highly mobile raiding force could devastate a region before the king's host could engage it in battle. Added to this was a second drawback. Those who held bookland were territorial lords with local interests, and were thus far more likely to seek terms with the Danish invaders, if by their timely submission they could save all or part of their inheritance. After his victory at Edington in the spring of 878, Alfred realised he could not rely upon the existing military system to counter the continuing Danish threat. If he were to survive and consolidate his hold upon Wessex, he would have to innovate, and this he did. The king's adoption of Danish tactics in the winter of 878, such as his use of strongholds and small mobile raiding parties to harry the lands of his enemies, was forced upon him by immediate circumstances. Over the next twenty years of his reign, he was to revolutionise Anglo-Saxon military practice. Alfred answered the Danish threat by creating an impressive system of fortified burhs [boroughs] throughout his realm and by reforming the fyrd, changing it from a sporadic levy of king's men and their retinues into a standing force. This system, and its extension into Mercia, enabled his kingdom to survive and formed the basis for the reconquest of the Danelaw by his son Edward and his grandson Æþelstan. He divided the fyrd into two rotating contingents designed to give some continuity to military actions. Rather than respond to Vikings with ad hoc levies of his local noblemen which were disbanded when the crisis had passed, the West Saxons would now always have a force in the field. As the Anglo-Saxon Chronicles tell us: 'The king divided his army into two, so that always half of its men were at home, half on service, apart from the men who guarded the boroughs.' Moreover, like the Danish heres [armies], Alfred's fyrd was to be composed of mounted warriors possessing the necessary mobility to pursue an enemy known for its elusiveness. The warriors who waited their turn 'at home' also filled a necessary defensive function. It was essential that some king's thegns and their retainers remain behind to guard their lands and those of their neighbours on campaign against sudden raids, if for no other reason than the obvious one that landholders would have been reluctant to leave their estates and families totally undefended. The warriors who stayed behind do appear to have been obliged to join the garrisons of nearby burhs on local forays. Alfred also had compelling administrative reasons for his division of the fyrd. The Anglo-Saxons did not draw much distinction between 'military' and 'police' actions. The same men who led the king's hosts, his thegns, gerefa [reeves] and ealdormen, also did justice. The same mounted men who were responsible for the capture of lawbreakers were also responsible for the defence of the kingdom - there was a thin line between posse and army! After all, the Danish invasions did not end ordinary criminal activity, in fact there is some evidence to suggest it may have increased. Alfred's innovations did not affect the basic makeup of the fyrd, which remained composed of nobles and their lesser-born followers. This is borne out from many sources; ordinary ceorls would generally be unable to afford the expensive horse required for fyrd service, the summoning of the fyrd left ordinary agricultural activities such as harvest unaffected, and not least, Alfred's own words. For Alfred society was divided three ways; beadsmen ( gebedmen) prayed, warriors ( fyrdmen) fought and workmen ( weorcmen) laboured, each a necessary, distinct class. This idea was reiterated by several later writers. The Alfredian fyrd was designed to act in tandem with the burwaran, the permanent garrisons that the king settled in the newly built burhs. The size of the garrison in each burh varied according to the length of its walls (4 men for every 51/2 yards), but an average one would have required a garrison of about 900 men. Because of this vast requirement for manpower, each burh was at the centre of a large district specially created for its needs. The landholders in these 'burghal districts' were charged with providing the men necessary to maintain and garrison the burhs, on the basis of one man from every hide of their land. This appears to be in addition to the landowner's obligations to serve in the king's fyrd. The scale of service demanded by Alfred and his descendants was unprecedented, the garrisons of the burhs alone represented a standing army of almost 30,000 without the fyrd. These figures suprisingly do not include the military strength of the navy that Alfred raised to counter the Danish threat either. The days of winning kingdoms with only a few hundred men were gone. How Alfred's fyrdmen were equipped is uncertain, although spears and shields still remained the prime weapons. It may well be that this was all the equipment the average burwaran would use, possibly supplied to him by his lord. The fyrdmen, on the other hand were a professional warrior class, drawn from amongst the wealthiest men in the country, expecting to face a well equipped, professional enemy army. 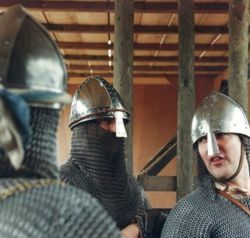 The evidence we have suggests that helmets, swords and mailshirts had become much more common by the time of Alfred's reforms, and most of the fyrd would have been equipped with at least a helm and sword in addition to their spear, shield and horse. Many would also have possessed a mailshirt. Some of the more well off burwaran may also have been equipped in a similar way to the fyrd. The innovations that Alfred introduced meant that within twenty years of his death, most of the Danelaw had been reconquered by the West Saxon kings and their Mercian allies. By the middle of the tenth century the last Danish king had been driven out of England and the West Saxon line now ruled the whole country. In the decades that followed, although the parts of Alfred's and Edward's system remained, the function of each had been redefined during a generation of peace. The fyrd reverted to its former incarnation as an ad hoc levy of noblemen and their retainers, summoned to meet a crisis, a far less expensive system than maintaining a standing army. The garrisons of the burhs were disbanded, and the burhs now stood merely as places of refuge for the civilian population. As such they failed to stem the Viking invasions which recommenced at the end of the tenth century. Burh after burh was stormed and burned by the invaders. Although some attempt was made to refortify some of the old burhs, it did little good without the integrated system of permanent standing army and permanent garrisons envisioned by Alfred. The vulnerability of the burhs, brought home by these disasters, led Æþelred to bolster their naval forces in the hopes of preventing the Danes from landing. He required every three hundred (or three hundred and ten) hides of land to build and maintain a ship with a crew of 60 men, thus extending the 'common burdens' to naval matters. The system of 'hundreds' was also refined in the tenth century as both a military and administrative district, headed by a 'hundred ealdor' who was the district's leader in peace and war, and who was responsible to the king's reeve or ealdorman. Also at this time, the kings' law codes placed royal authority on a more secure footing by equating it with lordship. These codes also made it easier for the king to exact the 'common burdens' and punishing those who were reluctant to fulfil their obligations as land-holders. They also made the king once more the lord of all 'fyrd-worthy' men, making the fyrd once more the king's retinue arrayed for battle, but with a great difference: fyrd service for many was now a condition of tenure. In the late tenth and eleventh century the system was further refined, at first under Æþelred and later under Cnut. Fyrd service was directly related to the amount of land held. The figure of one warrior from every five hides is often given, and on average this may well be the case, but the exact amount of land a man should possess to be required to provide a warrior varied a great deal. It seems that each landowner made his own arrangements with the king in respect of service, sometimes a man holding only a hide or two was expected to provide a warrior, sometimes an estate of well over five hides might only expect to supply one warrior. Five hides of land is the usual figure associated with a thegn at this time, although some thegns held much larger estates, and some of the poor thegns are recorded as having estates on only one or two hides. However, possession of five hides did not automatically gain one the status of a thegn. The coincidence of the five hide ruling with reference to both military service and the rank of thegn shows that it was predominantly those of thegnly rank who were expected to serve in the fyrd, the possession of the land putting the obligation on the man. It would usually be the land-owner themselves who served in the fyrd, but if for some reason the landowner was unable to attend in person, perhaps because they were a woman land-holder or infirm, they could send a replacement in their stead who was 'acceptable' to the king, or commute the service with payment. This payment would then be used to hire a 'mercenary' replacement. 77. Concerning the man who deserts his lord. And the man who, through cowardice, deserts his lord or his comrades on a military expedition, either by sea or by land, shall lose all that he possesses and his own life, and the lord shall take back the property and the land which he had given him. And if he has book-land it shall pass into the king's hand. 78. Concerning the man who falls before his lord. And the heriot [death duty paid in arms and armour] of the man who falls before his lord on campaign, whether within the country or abroad, shall be remitted, and the heirs shall succeed to his land and his property and make a very just division of the same. In addition to the warriors owing service in respect of their land, the eleventh century fyrd contained other types of warriors. A more ancient element within the fyrd, the king's personal entourage, retained its importance throughout the period. The huscarles of Cnut and the later Saxon kings represented the last elements of the earlier class of gesiðas. They formed a group of professional warriors in the direct service of the king, living in his hall and receiving gifts from the king in return for their service. They accompanied the king on journeys, served as ministers in peacetime and formed his bodyguard and the backbone of his royal host in times of war. Although often seen as mercenaries, because they received payment from the king, their service arose from the obligation to serve their lord rather than just a cash inducement. The body of royal huscarles is said to have numbered 3,000 by 1066, and it seems that by this date many of the other great lords also had their own huscarles, sometimes numbering into the hundreds. That mercenaries were also used is beyond doubt, the butescarles and lithsmen of this period are just that - warriors who fought for hard cash. Many of these men were probably employed in respect of lands who had commuted their military obligation for cash, although others were employed entirely in their own right. 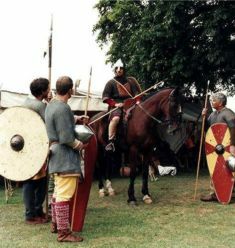 Although the reasons for service, and the professionalism of the warriors involved had changed, even at the Battle of Hastings, in essence the fyrd still consisted of the king's host arrayed for battle, supported by their own retainers, much as the armies of the earlier Germanic invaders had been, but on a much more massive, professional and well organised way. 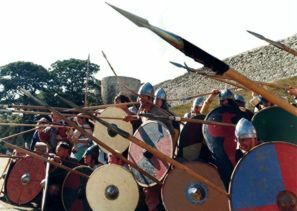 By the second half of the tenth century, and throughout the eleventh, the Anglo-Saxon fyrd was more than just a king's host arrayed for war, it was a well equipped professional army of heavy infantry. 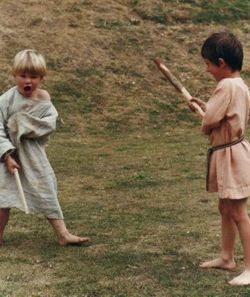 Although the spear and shield still remained the basic weapon of the fyrdman, it was now usual for all to have a horse, sword, helmet and mailshirt too. Some illustrations suggest that hand-axes were also used, but whether in addition to, or in place of, the sword is unclear. 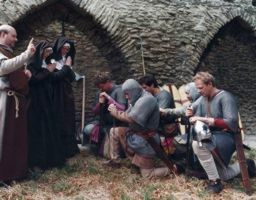 There are many references to even ceorls serving in the fyrd possessing swords, and that mailshirts and helms would have been widespread is shown by the fact that Æþelred commanded that every eight hides provide a helmet and byrnie. In addition, the heriot, that is the death duty paid to a lord when a thegn died, was set at four horses (two with saddles), two swords and a coat of mail. Since the heriot represented the return of the gifts of a lord to his retainer, we can see that this was the equipment a thegn would be expected to possess. That the thegns did possess this equipment is borne out by the fact that, although it was possible to commute this payment to cash, the payment was almost always made in the form of these arms. The reason for the large number of horses may be explained by the fact that it represented a mount and remount or pack-horse for the thegn and a retainer who would look after the thegn's horse while he was in battle, or carry messages for him, etc.. It appears that generally the huscarles were even more heavily equipped than the thegns. In addition to the equipment associated with a normal fyrdman, at least at the time of Cnut they were expected to own 'splendid armour,' including a double-edged sword with a gold inlaid hilt and a 'massive and bloodthirsty two-handed axe,' this latter weapon having been introduced into England in the course of the Viking attacks at the end of the tenth century. Of the equipment of the butescarles and lithsmen we know little, but presumably, if they were being used to replace members of the fyrd their equipment must have been at least of the same type and quality as a fyrdman's. Finally, it should not be forgotten that the king's right to call upon 'every able bodied man' for military service was never forgotten. Right up until the time of Harold Godwinson the king retained that right. However, just because the king had the right did not mean he exercised it. The duty to serve was confined to the shire boundaries and for a single day, otherwise the service had to be paid, except in the Welsh and Scottish Marches, where 15 days seems to have been the norm. It is useful to note that when this levy was called out, as in 1006, the term 'the whole of the people' is used rather than the more military term fyrd. As time went by and armies became more and more professional and better and better equipped, a 'peasant levy' of untrained men equipped with hunting spears, and perhaps if they were lucky, a shield loaned to them by their lord, became less and less use. If men such as this were called upon (and it would be rare for this to happen), they would not be expected to get involved in the thick of the fighting. Rather, they would get jobs such as holding the fyrd's horses, guarding the baggage train, ferrying supplies of javelins and water to the fyrdmen, tending to the wounded, carrying messages, defending burhs, etc.. After all how much use is an untrained, unarmoured farmer going to be against a well equipped, well trained professional warrior who's been learning his deadly trade from the first time he was able to pick up a weapon? Lordship and Military Obligation in Anglo-Saxon England, by Richard P. Abels. On Britain and Germany, by Tacitus, Trans. H. Mattingly. Anglo-Saxon England, by Sir Frank Stenton. Weapons and Warfare in Anglo-Saxon England, Ed. Sonia Chadwick Hawkes. Anglo-Saxon Military Institutions, by C.W. Hollister. The Laws of the Earliest English Kings, by F.L. Attenborough. The Anglo-Saxon Chronicle, Tran. G.N. Garmonsway. The Anglo-Saxon World, by Kevin Crossley-Holland. Part 1: The Anglo-Saxon Fyrd c.400 - 878 A.D.
Last updated 28 March, 2005. Article by Ben Levick 1995.